How to put the environment to work for literacy. And build a home library on a budget. It's Funday Monday! And as I'd predicted last Friday, there were some garage sale signs that grabbed my time and attention over the weekend. Garage sales. Hmmm. That idea easily takes my thoughts to literacy. First of all, a garage sale needs good signage. And that idea takes me to one aspect of early literacy known as "environmental literacy." This literacy generally begins to reveal itself long before your child is even talking. So today's tip for you and your child of any age is to take stock of what is all around you. What print do you see? How is it meaningful to you? What kinds of TALKing together can the two of you do around that print? Let's explore that... Early on, you know environmental literacy is at work when your young child shows awareness of print all around. Signs and symbols, colors and shapes, numbers and letters. WOW! All sorts of unique combinations of those pieces of print begin to take on meaning for your child. Yes! You know it's happening when, blocks in advance, you're made aware that you're approaching a McDonald's. Or a little pointer finger picks out that store or gas station your family frequents. Yep! Right over there. Or you witness pure joy emanating from your little one who's just glimpsed a favorite book's cover...or merely its spine. WOW! Children learn to read whatever environmental print holds meaning for them. 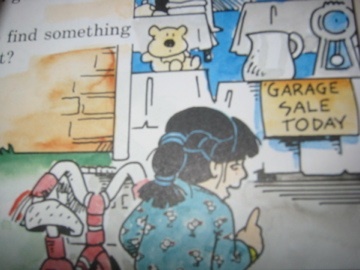 In my own children's case, by age 2, they could spot a garage sale sign, regardless of its style or script. That's because, nearly every Friday morning, we were out cruising the neighborhood streets. To see what we could see. 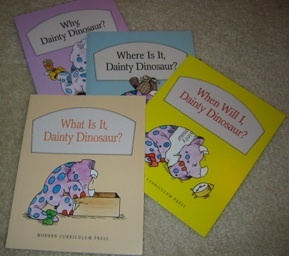 [caption id="attachment_739" align="alignleft" width="289" caption="Dainty Dinosaur series of 12 beginning-to-read books by Babs Bell Hajdusiewicz"] [/caption] Here's a tip for you and your older child who see garage sale signage: TALK about that print. What is it saying? Is it legible? What do you think? Large enough to read from a distance? Does it serve its purpose fully? How might a sign, for example, be better worded to make its point? What about that billboard over there? What's its point? How does its advertising work? Or not work? Garage sales also take me to thoughts of literacy as I think about inexpensive resources for building a child’s home library. New and nearly-new children's books are in abundance at many neighborhood garage sales. Your child's personal library serves as an ongoing on-site encouragement and support for building that daily habit of reading for enjoyment. WOW! It also provides great pride of ownership. A well-stocked home library provides plenty of children's books to stock those containers all around the house. Yes! A container of books in every room. And a bag of books in the car. A home library also ensures there'll always be a book to read in bed at night. Building and maintaining your child’s home library is an ongoing challenge. Your voracious reader needs an assortment that includes many titles for each reading and interest level. And your home library must grow and change as your child grows, and interests change. You’ll also want to add in some age-appropriate magazines. My family reveled in the discovery of garage sales as a book resource. Though the library was an excellent resource and just down the street, library books had to be returned. And the library wasn't always open when my kids were in need of a new book. And, they often worried, what if the librarian wouldn't allow us to renew that favorite book yet again? I’m told that young readers Ryan, Scotty, Maddie, Benjamin, Colin, and others have worried similarly. Yes! Research and experience tell us that good readers often choose to reread and reread again their favorite books. My family also looked to garage sales for added book buys before and during our many long-distance road trips. We often wished for library interstate lending policies since our avid young readers too often announced they’d finished their entire stash before we'd even crossed the state line. And with many states to go! I often get writing ideas from garage sale experiences. Yes! In What is It, Dainty Dinosaur? characters experiment all the way home with their garage sale thing-a-ma-jig. To see what it can do...or can't! Coming full circle, I find the idea of environmental print and garage sales connect right here at my desk. On the wall here hangs this plaque I simply couldn’t resist at a recent yard sale. WOW! 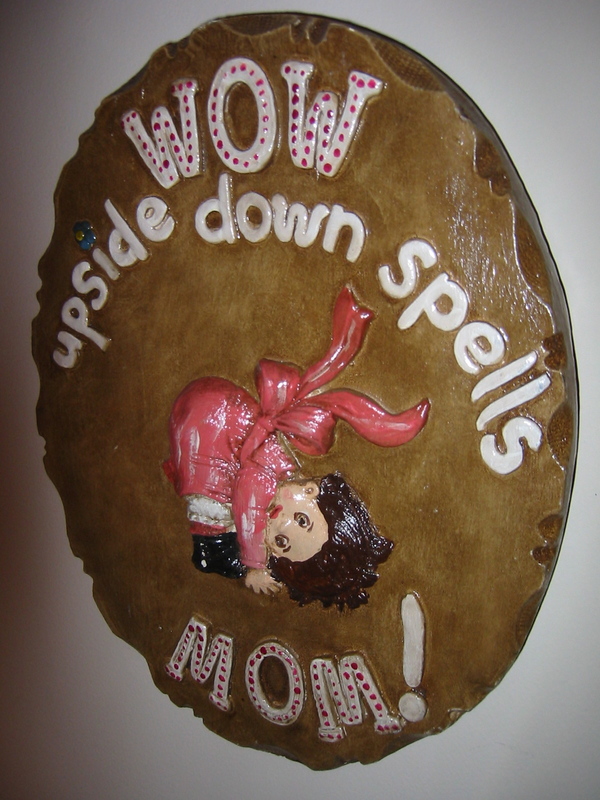 Environmental print is right here telling me a fact: Right side up or upside down. WOW! I’m a MOM! Yes! Environmental print is everywhere! And it offers you and your child lots of totally free conversation-starters! Have a Funday Monday! And tune in tomorrow on TALKing Tuesday to...well, you'll want to tune to find out how your Tuesday will be filled with TALK-TALK-TALKing with your child! Hey, thanks for stopping by. Check out our digital downloads right here in my store at www.babsyb.com. You'll also find many of my publications in my Bee with Babsy B store on Teachers Pay Teachers' site. Come back often!